Spartan Designs is turning 1 Year old! 1) The website must be hosted by Kwikweb. 2) Annual Domain registration fee and Monthly hosting fees is seperate from the prize and will be for the winner's account. 3) The prize cannot be exchanged for cash. 4) The winner will be selected by means of a "lucky draw". 5) Each nomintion a Charity receives will count as 1 (One) entry into the "lucky draw". The more times a Charity is nominated, the more chances they have of winning. 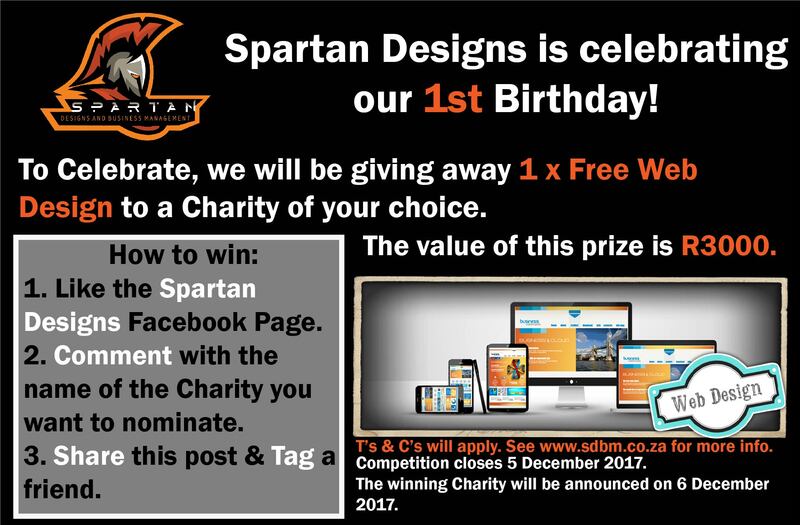 6) Should the winning Charity not be interested in the website for whatever reason, Spartan Designs (Pty) Ltd reserve the right to select another Charity. 7) This competition is only open to Charities within the borders of South Africa. 8) The competition closes on 5 December 2017. 9) The winner will be announced on our Facebook page and on this website on 6 December 2017.